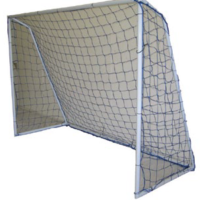 Order your Handball goal posts at SA’s premium online sports store. South Africans are embracing and having great fun with the traditionally US sport. SASportsGear stands proudly behind all our customers to help them perform at their best. We especially love helping them enjoy the experience! SASportsGear offer great quality handball goals. In addition to specialised equipment our range also includes conditioning, fitness equipment and accessories. This supports your cross training needs. From event kit and training kit to tracksuits and formal wear we help you to bring the team together on and off the court!